The Xbox One S is a slick looking game console that’s 40 percent smaller than the original and ditches the infamously gigantic power brick. It can display 4K video from streaming services and Ultra HD Blu-rays, and supports HDR contrast on video and games. Some users asked: "How to play any 4K MKV on XBOX One S". So today we gonna talk about how to successfully play 4k H.265 on Xbox One S.
Make sure the file types that you try to stream or play with Xbox One S are included in Xbox One S Media Player app supported formats list listed as below, or you will receive an error message. From above list, we can see that Xbox One S only supports to load 4K video compressed with H.264/MPEG-4 AVC, if the 4K video are compressed with other incompatible codec such as H.265/HEVC, XAVC S, Prores, MXF, etc. You will fail to load 4K video into Xbox One S. So today I will recommend you two ways to play any 4K MKV on Xbox One S.
You can play them off of an external drive, if it's formatted by the Xbox and is set as a media drive. The only issue is Windows recognizes and sees the drive (if you want to add more media), but can't access it. There are programs you can download, which will switch that drive from Xbox mode to PC mode and back again. It's a pain to do all that just when you want to play or transfer files. The easiest way I've found to play media on the Xbox is to stream it. Download Plex Media Server, it's free. Install it on your PC with your drive attached. It will find all your media and get the metadata for your library. Install Plex on the Xbox and you're good to go. The downside is that your PC has to be on when it serves media. If you have an older computer you can make that your server. Or you can do what I did and build a server with a Raspberry Pi 3. No matter what you choose, the Xbox plays all major formats natively, so you don't need a beast of a computer to transcode on the fly. Or you can download VLC which comes as a powerful media player, it can play almost MKV and other video formats. But you have to notice that it will be choopy when playing the 4k MKV files. Or it will shut down automatically during the transcoding process. MKV is an open standard, free container format, a file format that can hold an unlimited number of video, audio, picture, or subtitle tracks in one file. It contains different video audio codec, so you may think that it's not easy to sucessfully play 4K MKV on Xbox One S. You're half right, unless you have got a professional 4K MKV converter in hand. Today, I will share a converter for you which is called Pavtube Video Converter Ultimate which help you convert 4K MKV to 4K MP4, 4K MOV, AVI, MP4 etc. Hundreds of optimized device presets including Apple TVs, iPhone X/8/8P/7/7P, Sasmung, Xbox One, HTC, Wuii etc for you to choose. 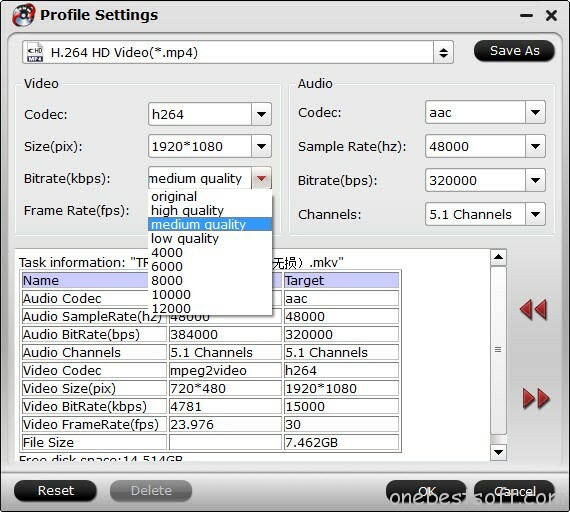 Moreover, if you are familiar with the video parameters, you are lucky here, this software allows you to adjust video audio codec, bit rate, frame rate, chennels. To save more space, you can lower bit rate to get smaller video file. Or you are able to change 4k to 1080p to make 4K MKV playable on any devices or media players. This feature-rich tool also allows you to trim 4K MKV video length, merge several 4K MKV into one, split one MKV file into many parts, adjust video effect, add external subtitles to MKV file for getting better understanding or foreign language leraning. More funtions in the guide for you to know this program in depth. Click "File" button to load your source 4K MKV video files. After loading, you could activate the build-in Player to preview 4K MKV video files. Batch conversion allow you to impot several files into this software in a time. You can either choose one of Xbox One S supported file fomrats listed above or direct output Xbox 360 preset profile formats which can also apply to Xbox One S. Or you can select "MKV HD Video (*.mkv)", "H.264 HD Video (*.mp4)" from "HD Video" category. Tip: If you want to keep 4k as output video resolution, you may go and click Settings, and adjust Size(pix) to 3840*2160. Meanwhile, if you prefer smaller video size, you can lower the bit rate to achieve this goal. Click the big green "Convert" button to start to convert 4K MKV to Xbox video immediately. When the conversion completes, you can find the output video file under the directory you just set.